Today has been a dream, a wisp. The descent into Florence was breathtaking. As I came out of the small plane directly onto the tarmac, the air smelled so refreshing and the sun felt soft and warm. I must admit I was smitten from the first moment. I found a taxi and gave the address of the Villa where I would be staying for the next two months, located in Sesto Fiorentino just outside of Florence. I rolled the windows down, looking at the gentle hills, wondering which corner would reveal my new home. 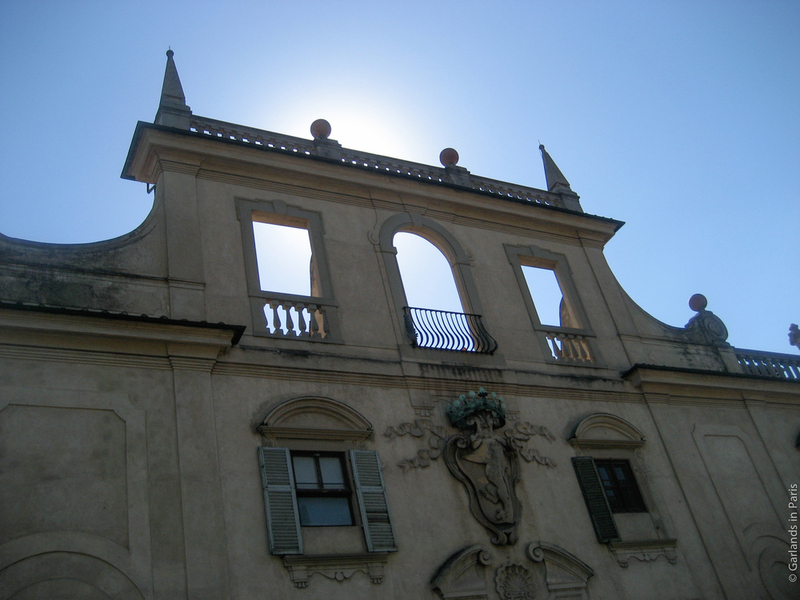 The roadside façade of the Villa Corsi-Salviati is a three block long stone rectangle, with windows and doors cut out. What struck me immediately was not the details, but the magnitude. The scale seemed too large, as if it were a giant’s home. I’ve never felt that way about architecture before. The kind villa manager greeted me and the other students with iced Italian mineral water and room assignments. Even the modest entry room had a vaulted ceiling and a large bronze family crest on the wall. I felt so excited to see what lay beyond each door. The next doors opened to an outdoor fountain with a statue of a man. 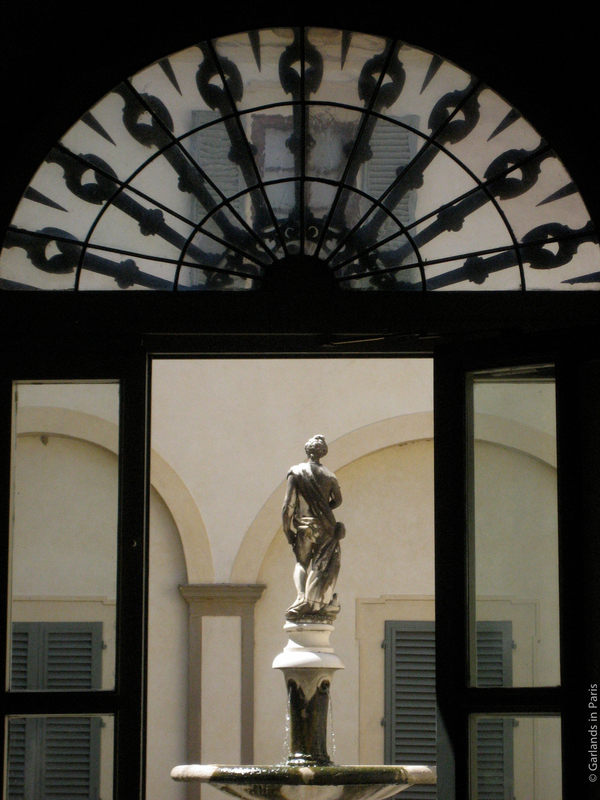 In the Tuscan heat, the courtyard felt like another room. There is something indescribably luxurious in having moving water in a living space. I entered another common room; a huge Venetian glass chandelier commanded my attention. As I am still not entirely familiar with the Villa’s snaky staircases and corridors, I can’t relate exactly what I saw next, but I can remember glimpses into rooms with Renaissance oil paintings, completely frescoed spaces, high ceilings, ancient thick walls, and tantalizing views to the grounds from the enormous windows. I descended to explore the grounds a bit. There is an enormous formal garden with statues and grand fountains, but there are more secluded ones too: one with a stream and an old bridge going over it. Everywhere are potted lemon trees. There is so much to explore and absorb. I still don’t quite believe I am in Italy. Before dinner, the other students and I stood around in the grass, barefoot. The light was divine. The cook, an older Italian gentleman, rang a bell on the outside wall for dinner. Our dining space is a long open room with enormous three-dimensional crests popping out. Dinner that night featured perfectly al dente sweet tomato-y pasta, local lettuce and tomatoes, brie and baguette. One of the professors brought his two children, and they played with a soccer ball in the golden sun. After dinner, I thought I would collapse. But I walked around the gardens a little, prompted by the setting sun. I went out to the formal gardens and the sky was pink. Everything was covered in that beautiful evening Tuscan sun that makes all it touches golden-hued and matte. It’s incredible that I’m here. More posts in the Garlands in Florence series can be found here.